Stefan French is an award winning film composer currently based in Dublin, Ireland. He has extensive credits, both in Ireland and in the US, across film, television, and commercial media. His film credits include ‘I’d Kill For You’ (Directed by Monika Wesley and produced by Los Angeles based Sobini Films. ‘I’d Kill For You’ received it’s World Premiere at the TLC Chinese Theatre in Hollywood on June 8th 2016), ‘An Ode to Love’ (Produced by Oscar, BAFTA and Emmy nominated Brown Bag Films. Winner of Best Irish Animation at Foyle Film Festival 2014, and nominated for Best Animation at IFTA 2015), and ‘The Guarantee’ (Directed by Ian Power and produced by John Kelleher Media for TV3. Nominated at IFTA 2015 for Best Script), among others. Previous commercial projects have included clients such as Intel, HP, CableLabs, Symantec, Miwadi, Avaya, Align Technology, RTÉ Radio 1 and TV3 Ireland. 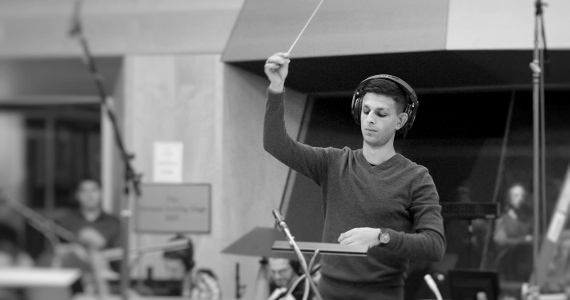 Stefan has recorded and conducted his work with the Hollywood Studio Symphony on the Eastwood Scoring Stage at Warner Brothers, and the Newman Scoring Stage at Fox Studios, in Los Angeles. In Europe, he has recorded with the RTÉ Concert Orchestra at RTÉ Studio 1, the Irish Film Orchestra at Windmill Lane Studio 1, and the Bulgarian National Radio Orchestra at BNR Studio 1. His scores have been mixed and mastered at Abbey Road Studios, Windmill Lane Studios, and Screen Scene Post Production. In 2015, Stefan was selected for the prestigious ASCAP Film Scoring Workshop in Los Angeles and, as a result of his work during this workshop, he received the ‘Steve Kaplan Film and TV Award’ from the ASCAP Foundation in recognition of his talent and achievements as a film and TV composer. Stefan is a member of the Irish Film and Television Academy (member of the jury for Best Original Score 2014), and IMRO. He is represented internationally for film and TV by SMA Talent Ltd, and for commercial media in Ireland by Silverstream Music Ltd.